A small classroom can seriously impact your child’s educational development. With preschool and kindergarten being important development years, creating a classroom that can address the unique and different needs of each and every student is crucial. At the Cary School, we have small classrooms with a teacher to child ratio being smaller than most other schools to cater to the needs of each child. Further, our lesson plans are created weekly to ensure that we are creating the strongest possible curriculum to help with your child’s early educational development. In this blog, we’re going to look at some of the many benefits a small classroom provides your child. A smaller classroom provides the opportunity for relationships to be created and strengthened. This helps create an educational community that is not only beneficial for development in an educational sense, but also crucial social development skills. As your child grows, they become more aware of feelings and their actions to others. A smaller classroom provides your child with the benefit of fostering crucial relationships with their classmates to help with social development and school-related issues in an open and engaging manner. Your child also becomes more comfortable in the classroom to share ideas and their perspective, as well as ask questions about material they may not understand. With a smaller classroom, a teacher has a stronger ability to focus on the unique needs of each child in the class. With a smaller class, it’s difficult for your child’s educational needs to be hidden and get left behind. It allows for the teacher to work with your child in a more engaging and interpersonal manner, which allows for enhanced learning. Students are more engaged in taking part in classroom discussions and asking questions about content they may not understand completely. Further, in a smaller classroom, children can learn faster leading in the progression of course material more quickly and efficiently. Teaching preschool & kindergarten can be tough on a teacher when the class size is large. With the immense energy that radiates from each child, a teacher’s job can get a bit more hectic with a larger classroom, especially when it comes to disruption. A smaller classroom allows the skills of a teacher to shine brighter as there is more tailored instruction to the individual students, as well as less disruption. This creates an atmosphere for your child to gain more meaningful experience and knowledge from school. At the Cary School, the focus on your child from our teachers is even stronger as our lesson plans are created weekly. This means that if there seems to be a progression in what students are learning, then the curriculum can be adjusted to reflect it.This is also true for the opposite, in case there is subject matter that a child may not quite understand, a lesson plan can be created to help strengthen your child’s educational needs. The smaller classroom provides a variety of benefits for your child’s educational development, and helps creates better results when it comes to graduating towards higher education. 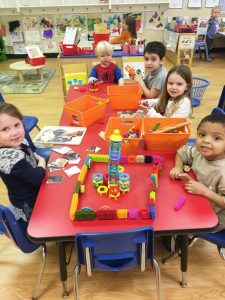 The skills, both educational and social, that preschool and kindergarten provide give your child the foundation to carry on into the next grade. With enhanced results from a small classroom, your child can go on to the next grade with confidence in their abilities to learn and skills that will continue to help your child as they grow in the world of education. When it comes to a small classroom, your child can gain many benefits that a larger classroom wouldn’t necessary supply. With a stronger community, more focus on each student, teachers strengthened ability to teach and enhanced results, your child can go fourth in their future of education with more confidence and knowledge. The power of a small classrooms, especially in preschool and kindergarten, provides your child with the attention they need. At the Cary School, our teacher to child ratio is smaller than other schools, providing an atmosphere for more interpersonal teaching. We create our lesson plans weekly, allowing for us to cater to the needs of each and individual child. Learn more about our programs now!